There have been moments in my life where I just wasn't 'feeling' it. I slapped on my smiley face, pushed open the door and ploughed through another day without any connection to happiness. On one of these days, I looked around the park at the children happily making dirt pies in the sandbox, and I noticed the adults seemed as bored as could be, whereas the children were completely absorbed in fun-making. What was it about children that made them so connected to joy? It hit me, as I caught sight of a small girl thoroughly inspecting a stick, whilst pretending to be a pirate. 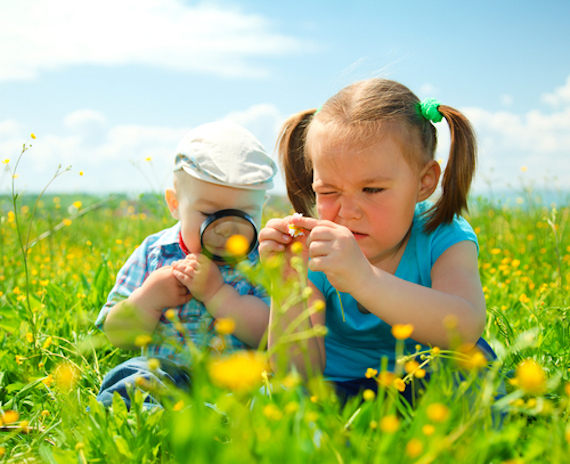 Children were constantly acting out of a state of curiosity; placing their attention on discovery. It's one thing to be curious about something, but it's the acting upon curiosity that unlocks joy. I was convinced I would need to look closely at my everyday behavior to see how my actions impacted my happiness levels. I decided to put my observations to work and participate in my own curiosity experiment. I set basic rules to get the experiment rolling: I would drive to an unfamiliar suburb everyday for 10 days, in search of brilliant coffee. I wrote down 40 suburbs that I had never visited in LA and placed each one in a bowl. The first morning, I woke up ahead of my alarm and raced to pull out a suburb. The lucky ticket was 'Atwater Village'. I pulled up outside an unpretentious coffee shop and jumped into a long line of tired looking Angelinos. After 5 minutes of twiddling my thumbs impatiently, I decided to strike up a conversation with the woman in front of me. "It's my first time here, what's the best thing about Atwater Village?" I blurted out, a little too eagerly. The woman looked annoyed and asked if I was talking to her. She was in her 50's, dressed all in black and hesitant. She was probably not used to overly perky Australians asking for her best recommendations at 8am on a Monday. But as soon as she sensed I was genuine, her body language opened, her eyes brightened and I witnessed her curiosity catching fire. "Have you been in the USA for long"? she asked, curiously. We stood in line; new friends exchanging knowledge of the east and west of our city, agreeing that the unspoken rivalry between the two sides of Los Angeles was petty. When her latte arrived, she warmly smiled goodbye and reluctantly ran off to work. The woman had left me feeling rejuvenated. An unexpected addition to my experiment. Over the next 10 days, I was amazed at the range of organic coffee being served around this bustling city. I documented the recommendations shared by passionate locals, who happily offered up their best kept secrets like pearls of gold, filling my curiosity cup. There was a sharp increase in my awareness; colors were brighter, the street vibe was buzzing, time stood still. But the most enlightening part of this experiment was the connection I made with people. With just 5 minutes each day spent triggering my curiosity, my community opened up and so did my faith in humanity. I was surprised at how infectious laughter amongst strangers can be, whilst waiting for an almond latte. Notably, even extremely serious looking humans want to let loose too! It was inspiring to witness both young and old become spontaneous with their conversation. Everyday I was more energized. Which suburb would I discover today? What could I learn? Where would the coffee beans come from? I was not only acting like a kid again, but my mind was expanding. I discovered by building upon my curiosity, the desire for novel experiences continued to grow long after the experiment ended. I now search for new ways in which to increase my knowledge. I am more conscious of being in the moment with people, and view general activities as opportunities to explore and cultivate life satisfaction. By actively enhancing my curiosity I was naturally increasing positive life experiences. Psychologist and leading scholar in positive psychology, Barbara Fredrickson's broaden-and-build theory, looks at how building upon positive experiences affects our wellbeing. When people experience positive emotions, their minds broaden and they become more open to new possibilities and ideas. Impacting individual's long lasting psychological, social, intellectual and physical wellbeing. (Fredrickson 2009). 1. Pick a subject you are interested in and take a class. Allow yourself to get excited ahead of time. You might choose music, art, sports or a language. By increasing a skill on a topic of personal interest, your curiosity cup will be topped up and so will your life satisfaction. 2. Start a conversation with someone you don't know. It could be your barista, someone at school or work. Ask a question, engage in listening, you might just learn something. 3. Try a new vegetable. Let your taste buds regain a childlike sense of discovery. Maybe you'll hate the taste but you'll definitely expand your horizon. 4. Go somewhere you have never been. It could be a day trip or a few hours. Don't plan anything, let spontaneity lead your exploration. You will be empowered by how fulfilling it can be to act upon your curiosity. 5. Find a new route to take to work, or a different path to jog. Look around you, notice the colors, the trees, the sky. Take this old trip in a new way. Expand your curiosity by finding the extraordinary in the ordinary. Remember, it isn't just being curious that counts, you must act upon your curiosity in order to build happiness.